The Linq Hotel & Casino officially launched on October 30, 2014. I was there for the big event and today I offer my observations on the newly-launched hotel and casino. There was a surprising lack of fanfare for the opening of The Linq Hotel, probably because it felt more like a renaming than the opening of an entirely new resort. In fact, the rebranding of The Quad into The Linq in some ways corrected what seems like a miscalculation in the first place. When the Imperial Palace was rebranded as The Quad as part of the larger Project LINQ a few years ago, many visitors (and some locals) were confused about what Linq was. On more than one occasion I heard the High Roller incorrectly referred to as The Linq. The popularity of the massive High Roller wheel and the Linq promenade overshadowed The Quad hotel, a brand which got lost among those more visible attractions. To clarify, Linq is the promenade which includes shops and restaurants. The Quad was the hotel, and High Roller is the giant wheel. Now things are consolidated a bit with The Linq Hotel, The Linq outdoor shopping district, and the High Roller. When the October 30th date was announced as the official launch of The Linq Hotel & Casino, I booked a room for that night so I could be in the middle of all the action. Below is my extensive review of my experience that night. 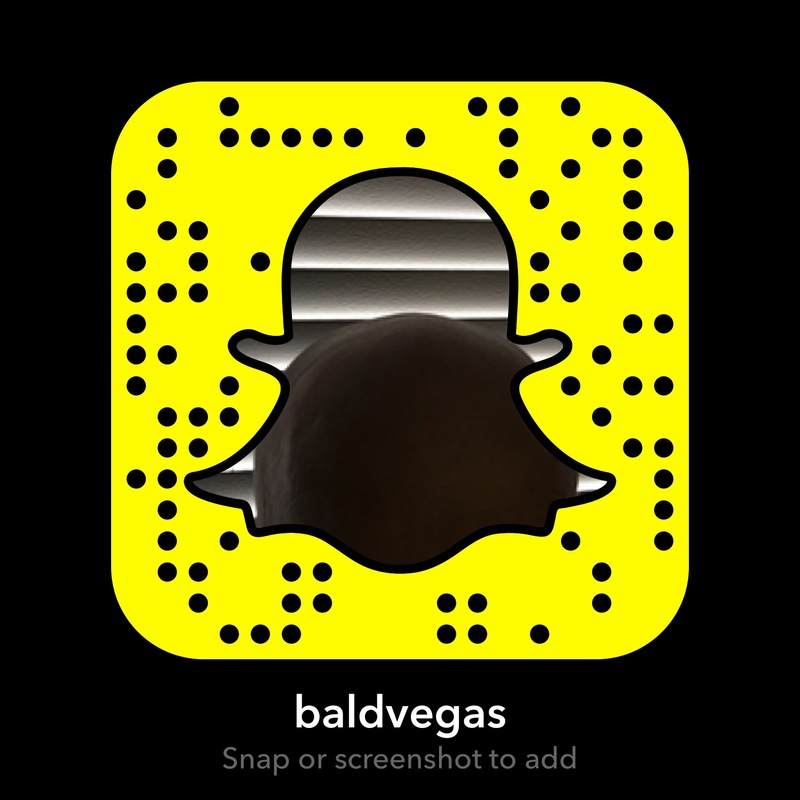 I found a spot in the parking garage, looking forward to what promised to be a unique Vegas experience, even for a local. Before I even stepped into the hotel/casino, however, I had to find my way out of the parking garage – which proved exceedingly difficult. I found myself lost in a maze of construction and dead-end escalators with several other guests. Although we were strangers, this group of lost hotel guests stuck together in hopes of finding our way to the elusive entrance. There were no signs in the garage pointing guests where to go. A stairway, which seemed to be the obvious choice, led us to areas which were clearly not meant for guests. Once I found what appeared to be the proper elevator, it didn’t work. Eight of us stood there waiting for the elevator that never came, and decided to take the stairs four flights down. Once on the street level, we followed the Hotel/Casino signs – right into a dangerous construction area. This is one of the areas we wandered into while trying to find the hotel entrance from the Linq parking garage. It took us nearly 40 minutes to find the proper entrance to the hotel from the garage. I told management, security, and a worker at the hotel that people were wandering around lost in the garage, but the next morning I still saw people struggling to find their way out of the structure. It was not a good start to my stay. A few signs pointing us in the right direction would have worked wonders. I had no problems checking into my room. The process took moments, and the woman assisting me was friendly and helpful. I was handed a room key for the third floor, and off I went. I found the way to my room and opened the blinds to see what was supposed to be a view of the High Roller. I paid a little extra to book a room with a High Roller view, and I imagined the magnificent wheel dominating the landscape from my room’s window. To my surprise, however, I found myself staring at the third floor of the parking garage. In fact, people in the garage – only feet away from my window – could see directly into my room. Even when the curtains were closed, there was an angle from the bed in which people in the garage could still see me. The parking garage continued to mock me with this view, which was supposed to be of the High Roller. I went back downstairs to try to correct this obvious error. After all, I booked – and paid extra for – a room with a High Roller view. I assumed it would be an easy fix. It wasn’t. A manager told me that room changes would not be accommodated until 7pm. Room changes? This wasn’t even the right room! When I explained that I booked and paid extra for a view, he told me that they would have to see if there were any such rooms left after 7pm. He wouldn’t budge, and I had a feeling there was something going on that he couldn’t tell me. As it turns out, I was right. Later that night, I found myself in an elevator with a construction worker. 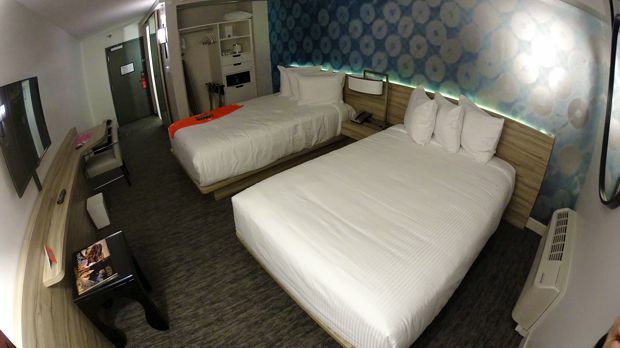 As we made small talk, he noted that, “None of the rooms above the tenth floor are done yet…” This explained why I was not the only guest complaining about my room: The Linq Hotel wasn’t completely finished in time for their opening. 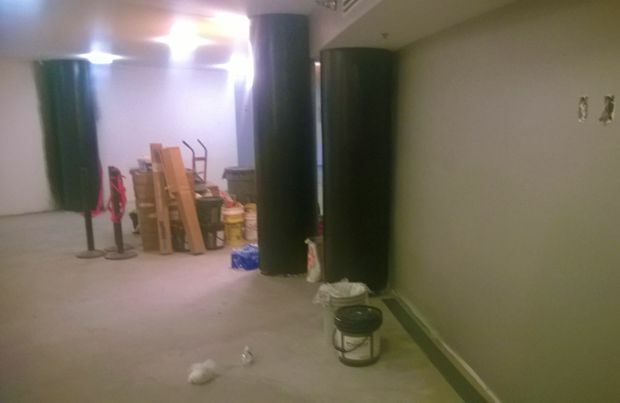 Indeed, some areas of the property felt more like a construction zone than a hotel. After 7pm, to the manager’s credit, I did get moved to a room up on the 10th floor with a view of the High Roller. 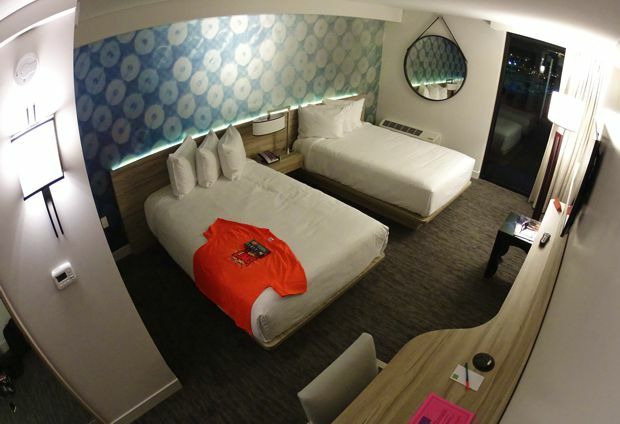 It wasn’t a king room as I had originally booked, but two doubles. But it was certainly better than the voyeuristic parking garage view I had before. The two rooms to which I had access had minor differences, but were generally the same design. I liked the light behind the headboard, and ample power access throughout the room. I also found the bed and pillows to be comfortable. I was disappointed, however, that the blinds were not “blackout shades” which are standard in most hotels. Even with the blinds fully closed, the sun was bright enough to wake me up in the morning. I found the decor to be aesthetically pleasing, and the hotel left a certificate keepsake for me as the first guest to stay in that room. The bathroom includes a shower, but no tub. There is a hair dryer provided, along with a sufficient number of towels. I’m not a fan of the no-door shower, and the water on the bathroom floor and toilet seat after my shower confirmed why. Both rooms had shampoo, conditioner, and body gel provided for guests. The third-floor bathroom offered this via small bottles, while the tenth floor room had dispensers attached to the shower wall. 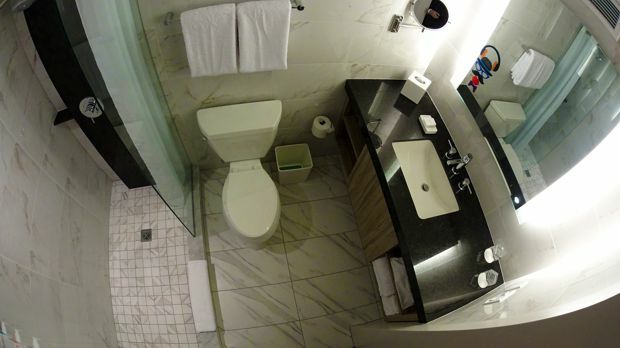 I liked the sliding door access to the bathroom, which doubled as a full-length mirror. As I was checking in, a woman assisting guests in line made a point to tell me, “You won’t have a problem with the Internet here.” Yet I did experience internet-related problems. First, while attempting to log in to the internet, I was informed that if I had purchased a “resort package” that I would not be charged, otherwise the cost would be $13 a day for up to two devices. This is confusing because the hotel automatically tacks on a resort fee when you book a room there. I felt compelled to ask the front desk if I was misunderstanding this, but I was told that the internet was part of the resort fee. I’m not sure why they would word it in a way that implies the resort fee was optional. It isn’t clear who would pay $13 a day if all guests pay the resort fee. After connecting to the internet, I didn’t find the speed to be impressive. In fact, I ended up connecting to my AT&T tethering device and used that instead of hotel’s WiFi. Even that was a bit problematic because cell service was quite spotty in both rooms, but worse on the third floor. A day after my stay, I looked closely at my final bill and noticed a $4 charge for “internet card.” Since internet access was supposed to be included in the resort fee, it’s unclear what this charge was for. The Linq is not a mega-resort like Caesar’s or The Mirage, and its options may seem limited to those guests accustomed to staying at larger hotels. There is a small market for drinks and snacks, a few bars, a wedding chapel, and a Hash House A Go Go restaurant. There is also a small area called O’Sheas which is the return of this iconic name to Las Vegas. O’Sheas has a completely different vibe than The Linq, and drew a pretty sizable crowd. The High Roller peers down at the crowds which filter through the promenade. 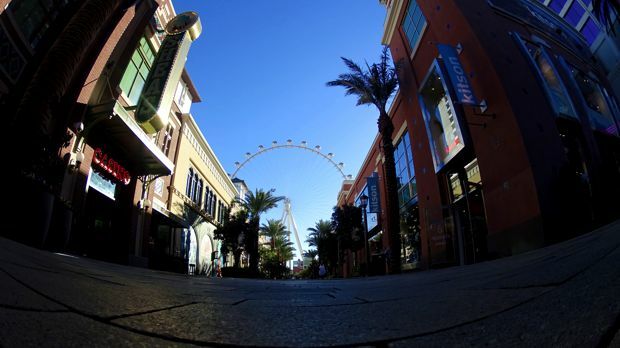 Even if that attraction doesn’t appeal to you, the atmosphere, variety of shops, and people watching at The Linq promenade is as good as it gets in Las Vegas. Indeed, it appears that as The Quad, the hotel was overshadowed by promenade (The Linq) and the High Roller. Perhaps this is why the hotel re-branded and adopted The Linq name. The promenade sits in prime Strip real estate, and its construction was a brilliant move by Caesar’s to insert a sort of mini-Strip which diverts pedestrian traffic into their own stronghold. It hosts a wide variety of establishments, from pubs, quick eats, and even a store specializing in hipster hats. Popular kiosks takes photos of tourists and allows them to log into their Facebook accounts and post their pictures online. I’ve been down to the Linq promenade on a few occasions, but on this night I found the Tilted Kilt to be a particular favorite – and a godsend after my parking garage fiasco. It’s a great little pub with lots of televisions tuned to sports, a well-trained staff, and decent prices and food. Another plus: Both the Linq hotel and promenade are loaded with security guards – a sight sorely missed along some stretches of The Strip. 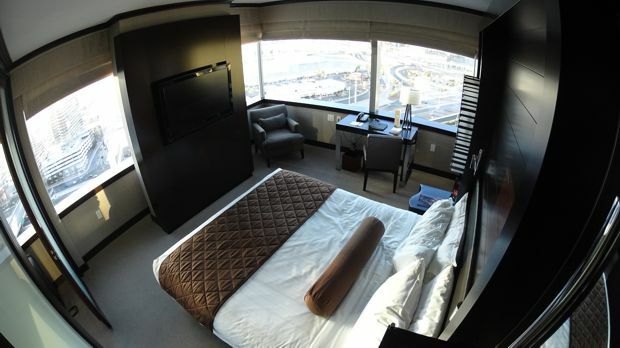 My stay at The Linq Hotel & Casino was plagued by a disorganized opening. Once the dust settles, I imagine that things will smooth out for future guests. The Linq’s highlights are clearly the High Roller and promenade. As a hotel, The Linq can’t compare to some of the massive resorts in the area, but it offers newly-remodeled rooms in a prime location, which are competitively priced. 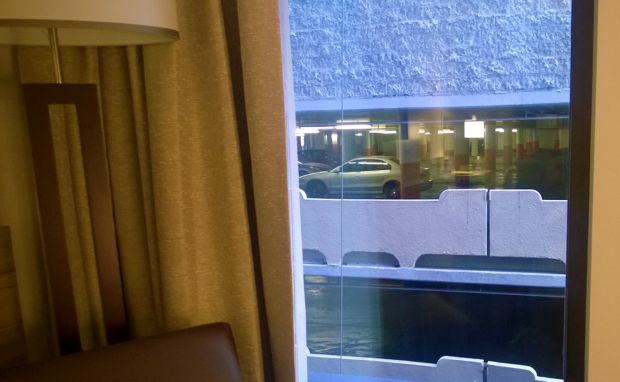 I would suggest avoiding rooms on lower levels that look directly into the parking garage, which destroys the sense of privacy or any sense that you’re in Las Vegas.